Hi, my name is Ed Graziani. My maternal grandparents were Paul and Mary Fedorowicz, who lived in the Bronx, NYC, USA, until their deaths. Grandpa Paul Fedorowicz was born in New Jersey, USA, circa 1902. Grandma Mary's maiden name is Knapek. She was born in Lipinki, Lesser Poland Voivodeship, Poland, circa 1907, and emigrated with her parents and sister to the United States, when she was 5 months old, in the same year. She and my grandfather were married in a Catholic church, sometime between 1920 and 1924, in Montgomery, New York. Both my grandparents were very private, emotionally distant, and perhaps fearful/xenophobic, people, and I remember as a child asking (sometimes begging) them to tell me about their Polish heritage. Both adamantly -- almost defensively -- insisted they never talk about the past -- and they both died with their "secret." I was told that my grandfather had volunteered for both WW1 and WW2. I know virtually nothing of my/their Polish heritage and I am eager to discover anything I can about their histories. They were both Catholic and raised their children in the Catholic Church. Conversely, my father was Italian, and he came from a strict Catholic upbringing. About 25 years ago, I researched the possibility that there were Jewish ancestors in my family. For a number of reasons, I always "felt" Jewish. 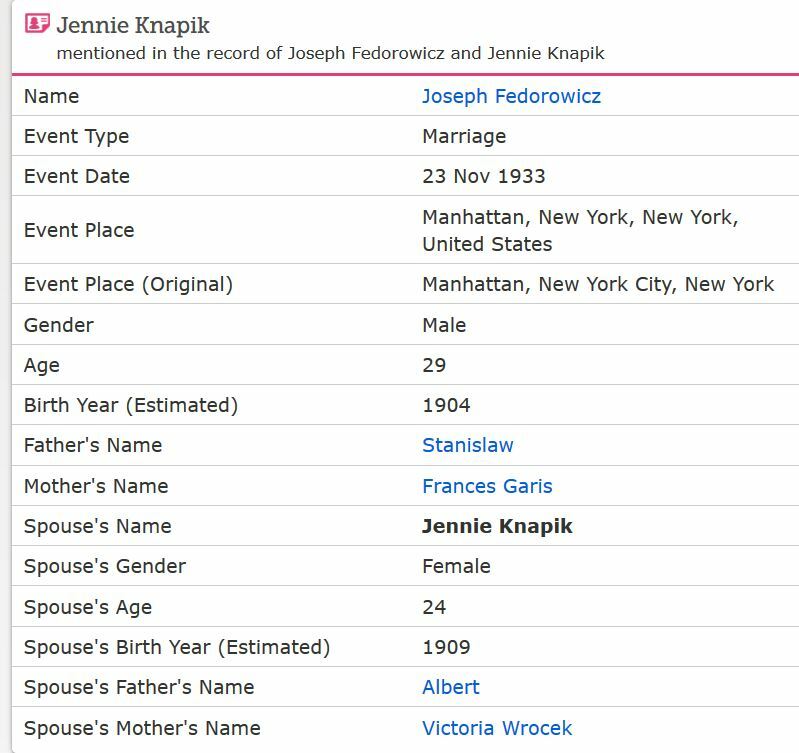 I found an agency in New York which maintained a database of known Jewish names but it turned out that neither Fedorowicz nor Knapek were listed. I never thought to ask about my father's Italian name. About 10 years later I discovered that my father's name, Graziani, was a fairly common Italian Jewish name (at the time, the conductor of the Israeli Philharmonic was a Graziani and had just died) and it inspired me and my brother to have our DNA analyzed (both paternal and maternal DNA sequencing) and to our happy amazement, there were significant Jewish links on both my father's and mother's sides (even though the Polish names were not listed as Jewish). I have even speculated that the "secret" that died with my grandparents might have been that their parents/grandparents/ ancestors were Jews and at some time either converted, or were forced to convert, or perhaps had been involved in supporting Jews, or dare I say persecuting Jews. Sadly, by the time I discovered my Jewish roots, both my parents, all four grandparents, and all of my aunts and uncles, had died, so there was no one from their generations with whom to share this amazing news. I am planning on contacting the Catholic Church in Montgomery, New York to ask about my grandparents' marriage records. In addition, if anyone has any advice for me as to where else I could look for information about the Knapek name from Lipinki, and the Fedorowicz name from Poland and New Jersey, it would be deeply appreciated. I do not speak or read Polish so I am hoping I can find some English-speaking websites in this regard. Thank you very much. Wow!! Thank you very much for doing this search! I'm amazed at how quickly the information was found. I had no idea they were married in Amsterdam (which is in Montgomery County). The information I found was that Montgomery was a town and I was about to contact the Catholic Church in Montgomery, NY. I just found the marriage information (application for license, marriage certificate, etc.) on FamilySearch.org and Grandma's name is spelled Knapik in a number of places. I will do a search on both. I'm almost positive you found my Grandpa's Navy record. Mom told me that Grandpa volunteered for both WW1 and WW2, and that he was in the Navy. And he died on either August 30th or August 31st in 1989. I don't know how to thank you. I never thought I'd be able to find any definitive information. You're inspired me to forge ahead valiantly!!! There is a family tree on Ancestry that says Stanislaw Fedorowicz, was born 4 Apr 1863 in Stryjówka, Zbaras, Galicia (now Ukraine), died 11 Apr. 1957 in Amsterdam NY. Says he married Franciszka Geras 8 Nov 1886 in Kretowce. I found this website regarding the area of these 2 villages http://www.longinus.org.pl/niezapominajmyang.htm This family tree also says Franciszka was from the same village as Stanislaw, born 1864 and has her arriving 23 Jun 1898 on the SS Barbarossa from Bremen with Marya age 9 and Anna 6 mo. from Stryjówka and going to husband in Newark NJ. It appears Stanislaw, age 30, may have arrived from Hamburg on the SS Scandia in the Port of Baltimore on 31 Aug. 1891 going to Maryland and from Lemberg (Ger. name for Lwów Poland, now Lviv Ukraine). There does appear to be another Stanislaw Fedorowicz who lived in Mass. but he was from a different village. The marriage record says Mary was the daughter of Albert Knapik and Victoria, but in the 1920 Census Albert is now married to someone named Rose, daughter Mary age 13, Genevieve age 10 and son Edward age 2 living with them as well. 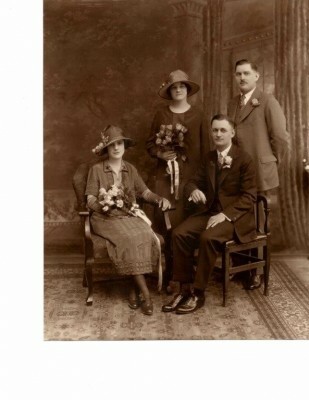 Found reference to a marriage record in familysearch.org for Albert Knapik age 37 widower (son of Martin Knapik and Regina Wilczak) marrying Rose Ambrcza age 25 on 26 Jul 1919 in Montgomery County NY. 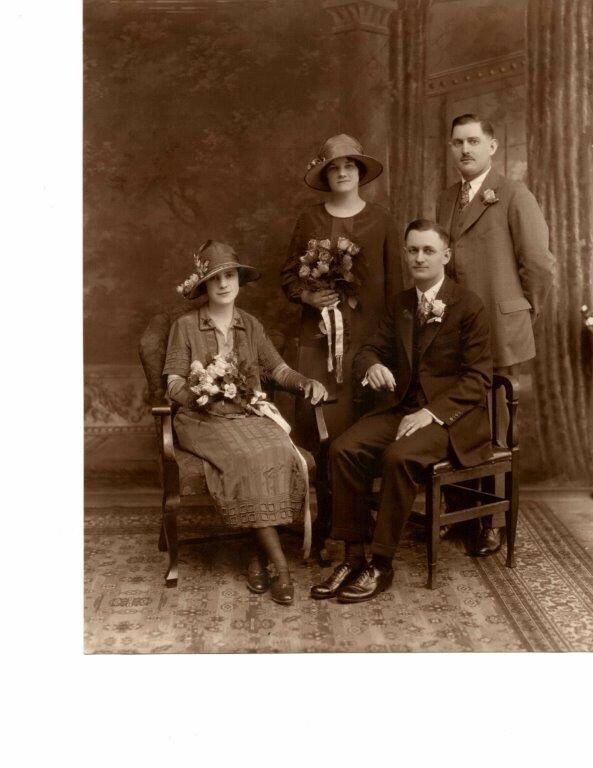 On October 28, 1916 widower Albert Knapik, listed as 27 years old, son of Macin Knapik and Rajna Wilczak married Apolonia Lenard in Montgomery County, NY. 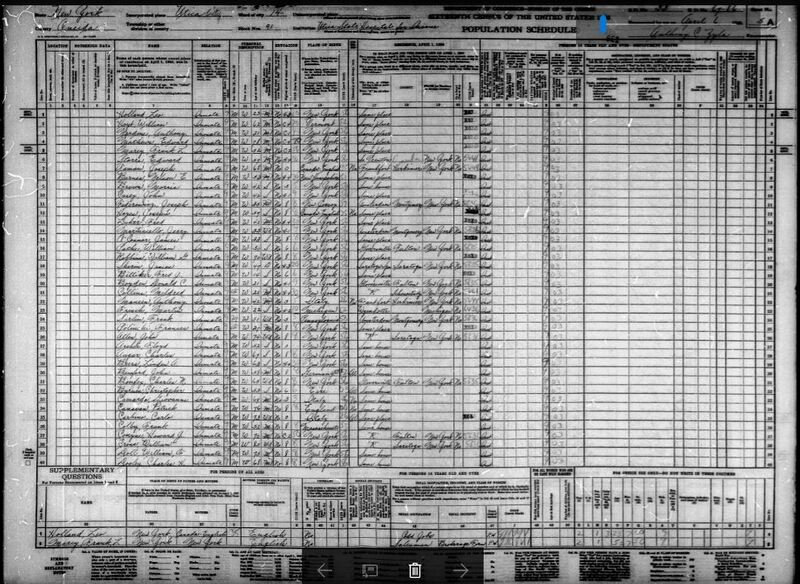 Note, The 27 years old part does not match for Albert, but the parents appear to match those on the record for the marriage that PolishLibrarian found for Albert and Rose, married by the same priest. In 1917, Wojciech Knapik registered for the draft for WWI in Amsterdam City, NY. He shows his wife as Apolonia. Wojciech is Polish for Albert. His stated birthdate is October 30, 1878. Ed, you may want to check with St. Stanislaus Church in Amsterdam to see if they show a death for your great-grandmother, Victoria Knapik between 1910 and October, 1916. Here is some information to follow up on what PL and Looking for Clues found. It seems to provide some answers to your questions. 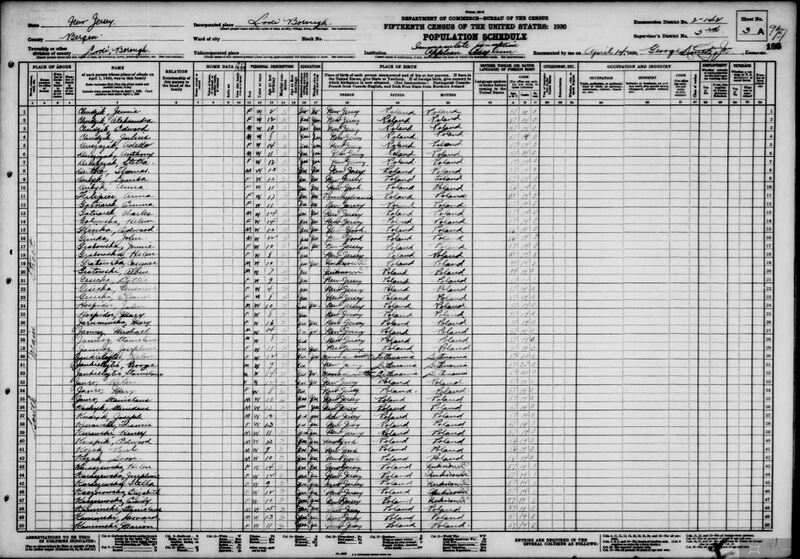 According to the 1910 Census Albert/Adalbert/Wojciech first immigrated to the US in 1902. At some point he must have returned to Europe since Mary was born in about 1907. Mary & Victoria immigrated together in 1908. Genevieve, who was Mary’s full sister, was born in the US in about 1911. Edward is Mary & Genevieve’s half-brother. He was born c. 1918 and his mother would have been Apolonia Lenard, who must have died either in late 1918 or early 1919. Possible causes of her death could include complications from childbirth or the Spanish flu epidemic of 1918 or one of the other communicable diseases which plagued immigrant communities. In any case, Albert would have needed to remarry quickly since Edward would have still been an infant and his daughters would have still been pre-teens. Enter Rose. It appears that Albert died in either 1924 or 1925 since his widow, Rose, married Bartholomew Podolski at St. Stan’s on June 21, 1925. It appears that Edward did spend time in an orphanage since an Edward Knapik is found on the 1930 Census in Immaculate Conception Orphan Asylum in Lodi Borough, Bergen, New Jersey. He is listed with the correct age for your Edward. 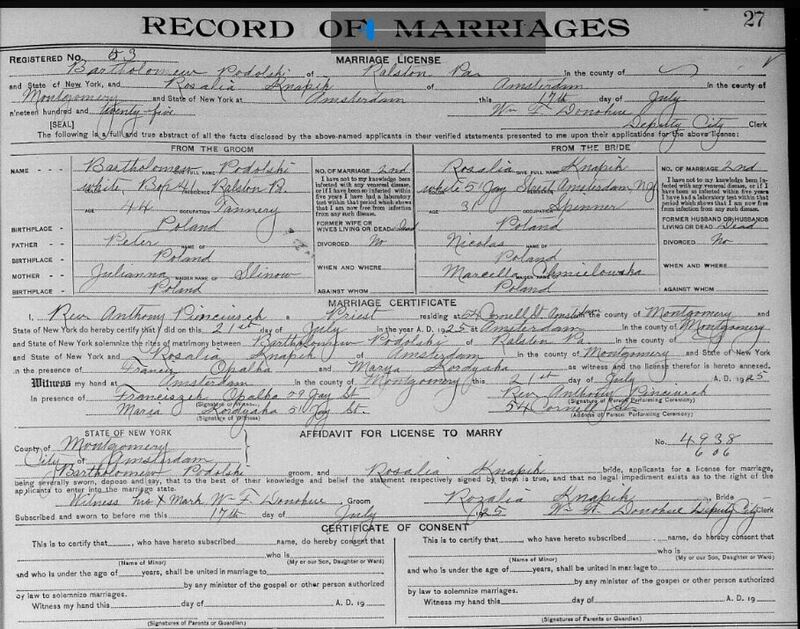 There is a marriage record for Jennie Knapik in Manhattan, NY on November 23, 1933. She married Joseph Federowicz, Paul’s younger brother. (Your grandfather Paul had another sibling in addition to his two sisters.) 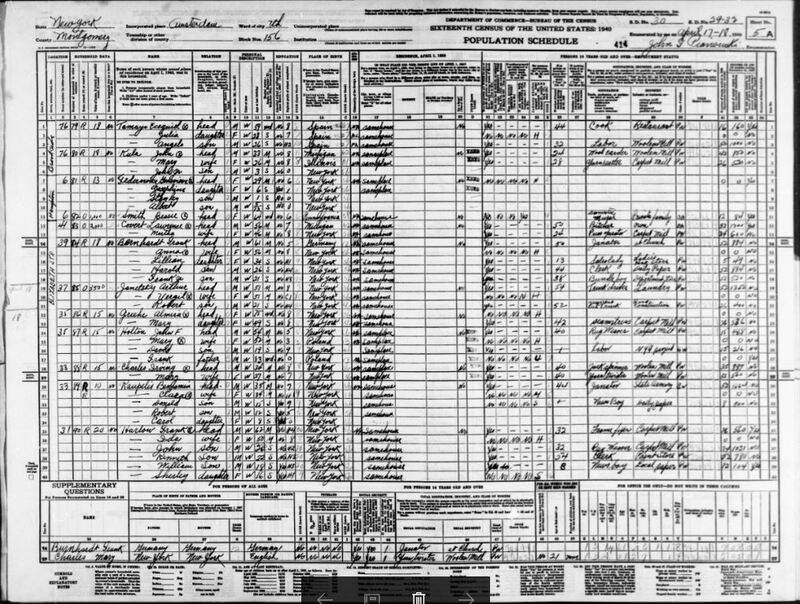 The 1940 Census lists her as married and the head of the household and residing in Amsterdam, NY with her daughter, Josephine, and sons, Albert & Stanley. In 1940 Joseph Federowicz is a patient in a mental hospital in Utica, NY (Utica State Hospital for the Insane). Their son Albert is listed in US Public Records as born in 1939 and residing in Gloversville, NY from 2005-2007. All the marriage, baptism and death/burial records for Albert Knapik, his wives, and his children (with the exception of death records of the children) should be found at St. Stan’s since that appears to be the family’s parish from 1910 through at least 1925. Perhaps the family secret your grandparents would not speak about revolved around Joseph Federowicz’s mental problems since until fairly recently there was a stigma attached to family members who suffered mental illness. As far as the speculative question is concerned…Jews in Poland were not treated the way they were in Spain or England or France during the late Middle Ages. One of the hallmarks of the Polish-Lithuanian Commonwealth was freedom of religion. Jews were welcomed in Poland when they were expelled or forced to convert to Christianity in other places in Europe---hence the large Jewish population in Poland until WWII. This religious tolerance extended to other denominations as well and the Commonwealth had a population of people of various faiths---Roman Catholics (the majority), Jews, Orthodox, Lutherans, Mennonites, Hussites, Muslims (in the Eastern portions of the Commonwealth, etc. When a person converted to the Catholic religion it was something voluntary and was recorded in the parish baptismal register. (Converts from a Non-Christian faith were baptized at the time of their conversion and Non-Catholic Christians who had been validly baptized in their own faith simply made a profession of faith by which they accepted Catholicism.) Although religious tolerance in Poland was not the dawning of the Age of Aquarius and certainly prejudice did exist, for centuries Poland was the most religiously tolerant country in Europe. When someone did convert from the Jewish faith to Catholicism things may not have been as smooth as silk, but the problems were usually family related. A case in point…the first pastor of the parish where I was raised in Chicago was born Jewish in Poland. While he was studying in Vienna he converted to Catholicism and eventually was ordained a Catholic priest. When this took place his father disowned him and they never reconciled. According to his own statements as recorded in an article in the Chicago Tribune in 1897 he returned to Poland after the death of his father. While there he tried to get his mother to convert and she tried to get him to return to the Jewish faith. Both were unsuccessful. That was a family problem, not a societal problem. Forced conversions were just not a Polish thing. Attachments beyond the limit will follow in another post. Anyway, I hope this gives your research added direction. Here are the final attachments. I am a cousin! My Grandmother was Paul's youngest sister. There were 3 girls and 2 boys: Mary, Frances(? ), Stanislawa (Stella--my Grandmother) Paul and Anthony. Anthony or Tony is buried on Long Island--was a veteran WWII. Not sure where this Joseph comes in, as he was NOT Paul's sibling. The 2 oldest girls were born in Europe. My grandmother and the 2 boys in the States. They never spoke of the "old country" but did not consider themselves Polish--Ukrainian or Russian or?? according to Grandma. Both were spoken, as well as their own dialect, French, German, and Great Gran Pa Stanislaw was conversant in Latin, as well. German was stopped after WWI and they moved from Newark NJ to Amsterdam NY sometime after WWI. They are buried in Amsterdam( Stanislaw and Frances). We have the maiden name of Gerez/Jerez/Geras for Great Grand Ma Frances--so could be any of the spellings. I am attempting to find more out about them, but it is not easy with the records being limited. My grandmother spoke of Lvov, Sternopal? ?, Budapest, and Vienna forming a general area they would have been familiar with. They supposedly came with Austrian passports--but those are long gone with no record of them in the Russian nor Austrian archives. Stanislaw anglicized his name to Stanley. There are other grave photos in an album within the Facebook group called "Zbaraz Area Genealogy (Military, Voting Rolls, Graves, Relocation, etc)"... many taken by yours truly!! We couldn't take every photo but we took what we could... hope you might find something of interest... Best, Steve. PS I also have family that relocated to Amsterdam NY ...they were from Kretowce ...(to clarify those who did not come to the US pretty much relocated to Lipinki) ... anyway....small world! !